The MCT (Mercury-Cadmium-Telluride) IR (infrared) Detector Module is a thermoelectrically cooled detector element and preamplifier package optimized for acquiring spectral data with the LaserTune Quantum Cascade Laser (QCL) source. With the module, users can configure a spectrometer in a variety of ways for applications such as IR microscopy. Spectral data is acquired and viewed in the LaserTune application software without the need for additional data collection or processing electronics. 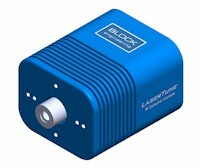 The module is also optimized for the emission profile and fast scan rate of the LaserTune QCL. Since the module represents the same hardware employed in the fully integrated LaserScan spectrometer system, users get maximum versatility without sacrificing system performance. And unlike other commercial MCT detectors, the MCT IR Detector module requires no liquid nitrogen to operate. LaserTune's wide tuning range, flexible tuning, and superb beam quality make it ideal for high performance laboratory applications, and its compact size allows for easy integration into any system or instrument. Download a detailed specifications sheet for the MCT IR Module (PDF). If you would like to discuss how the LaserTune with the MCT IR Detector Module can help with your application needs, please contact us.